Successfully Added VKWorld F1 Android 5.1 Smartphone - 4.5 Inch 854x480 IPS, Smart Wake, Quad Core CPU, 2 SIM, Bluetooth 4.0 (Red) to your Shopping Cart. Check out VKWorld’s latest smartphone. The VKworld F1 comes with a 4.5 inch IPS screen, Android 5.1 and Smart Wake. It also features two SIM cards and Bluetooth 4.0. 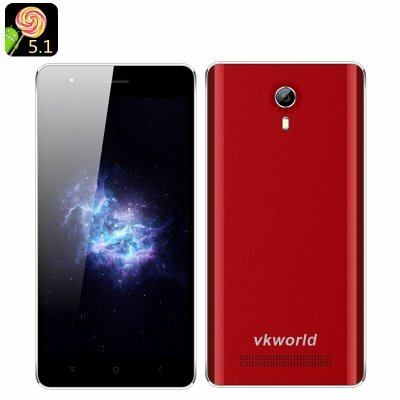 The VKworld F1 Android smartphone is great device for all those looking for functionality on a budget. The smartphone offers all the feature needed for efficient communication, entertainment, connectivity and easy navigation – and yet will not require you to reach deep into your pocket or affect your savings plan. The VKworld F1comes with 3G network support and 2 SIM cards, letting you manage two separate phone numbers and accounts on the same device. This is very useful feature separating your private and business affairs. Smart Wake is another great addition. The feature gives you access to some of the selected apps right from the locked screen. So, should you often requite instant access to your Camera, Browser, Messages or other applications, you will find this smart feature super handy. The VKworld F1does not come with a huge tablet-sized screen, but instead offers you a compact way to enjoy all your media. Its 4.5 inch screen is easy to operate and offers great viewing quality..
Made in exciting red, the smartphone boasts a contemporary design and will act as stylish accessory in addition to all its practical features. This phone is fantastic. Atfer more than 6 months use, I like it. Thank, I received product at 20 April 2016 with condition " Good", i like packaging safety in used for protected the product delivery.